Today, I received a signed Nico Bodonczy card. 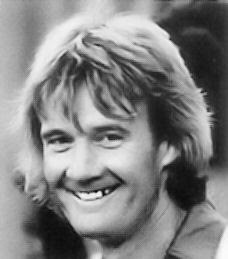 Nico played for the Rowdies as a guest player during the 1976 tour of Haiti. Many thanks to Ray Knisley for his help in obtaining this. Stewart Scullion's 1972-73 FKS Publishers card, whilst he was at Sheffield United. Many thanks to Kenn Tomasch. If you haven't already heard, the new Rowdies are now up and running. With only 18 days left before they Kick Off their new NASL season on Friday, April 16th at Crystal Palace Baltimore. Having made a great start in their warm up games, with 2 draws and their first win over MLS side - Philadelphia Union, things are looking good. They still have two remaining warm up games - University Of C. Florida, March 26th at Lake Myrtle Complex, and University Of S. Florida, April 10th at USF Soccer Stadium. For more information on the New Rowdies go to: http://fctampabay.com/ - You won't be disappointed!! 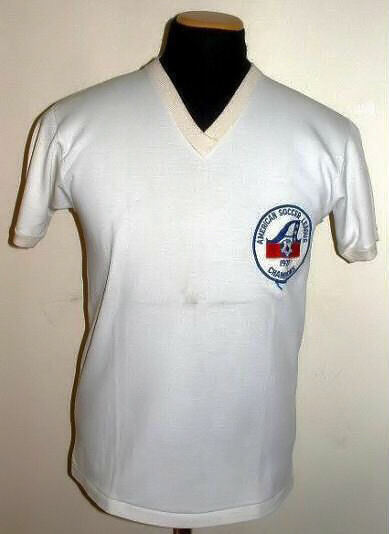 Unique and vintage jersey issued for the American Soccer League ( ASL ) Champions Cincinnati Comets and future Rowdie Ringo Cantillo after the Championship Game against the New York Greeks in 1972. He was issued with this as he was named the Championship Game and League MVP. 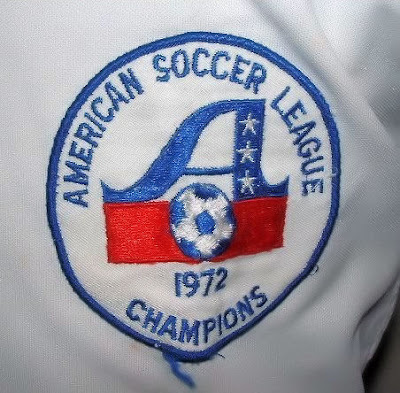 American Soccer League Champions logo embroidery. 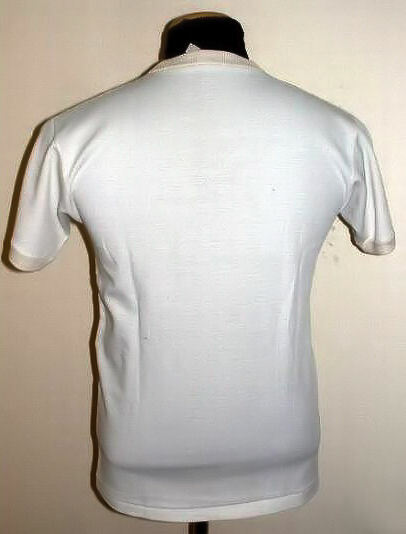 Front view of the jersey. 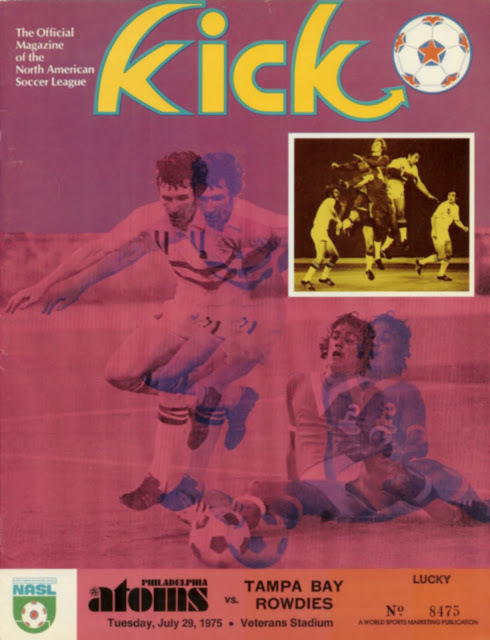 This edition of the KICK magazine covers the away game against the Philadelphia Atoms played at the Veterans Stadium in Philadelphia on July 29th, 1975. 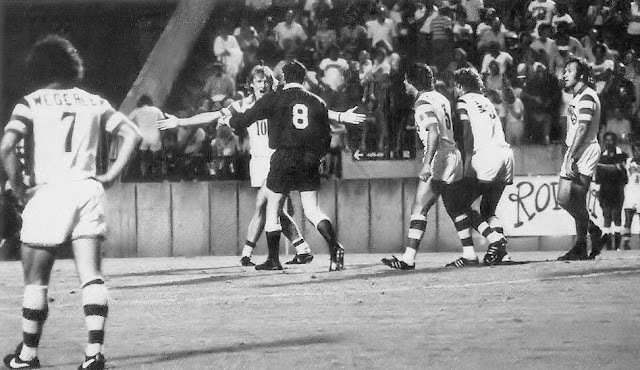 With a small attendance of 4,517 watching the Rowdies win 1-0, with the goal coming from Derek Smethurst. The team that day: Hammond, Quraishi, Linton, Pringle, Jump, Connell, Boyle, Smethurst, Sissons, Garber, Scullion. Substitutes: Austin, Auguste. Many thanks to Andy Northern. 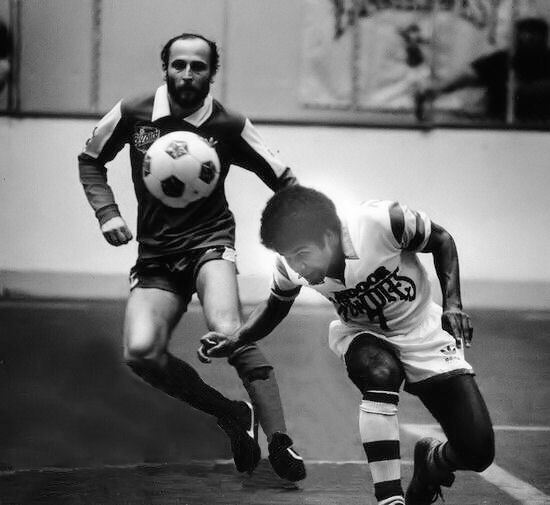 Zequihna in action against the Toronto Blizzard's Bruce Wilson during the 1981-82 indoor season. Rodney Marsh's 1974-75 FKS Publishers card, whilst he was at Manchester City. 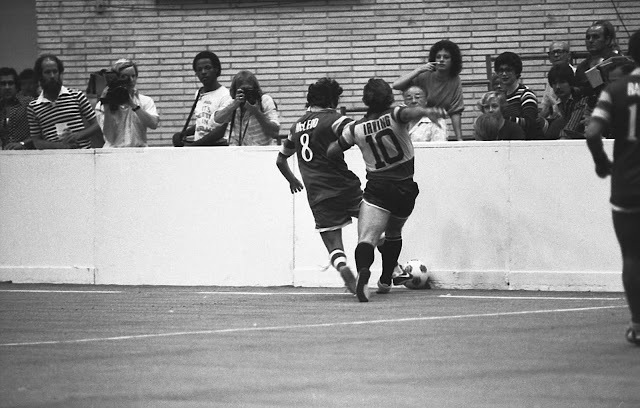 Wes McLeod beats Ft. Lauderdale Strikers' David Irving to the ball during the 1980 indoor season. Many thanks to Dave Morrison. Rodney Marsh leads the complaints to the Referee, with Steve Wegerle, John Gorman, Jan Van Der Veen and Oscar Fabbiani agreeing with him in 1979. A collection of 7 different Rowdies' badges. One is a colorful 4" wide green, yellow, & white unused satin patch with the Scott Ross cartoon image mascot "Indoor Rowdies it's off the wall" . 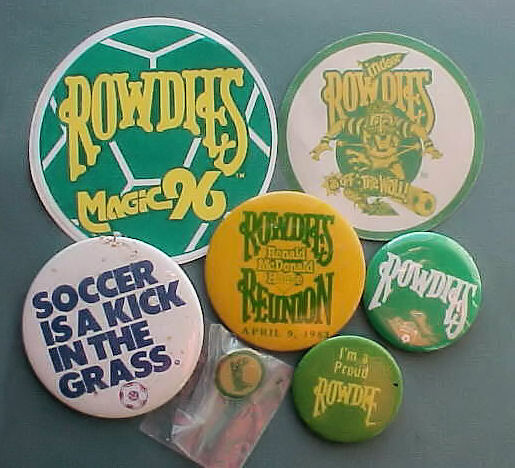 One is a 5" wide green, yellow & white vinyl lapel sticker designed to look like a soccer ball with the slogan "Rowdies Magic 96" on front and a long ad for the 1983 Rowdies Vs. Chicago game on the back. One is a 3 1/2" wide RWB cello pin with the slogan "Soccer is a kick in the grass". 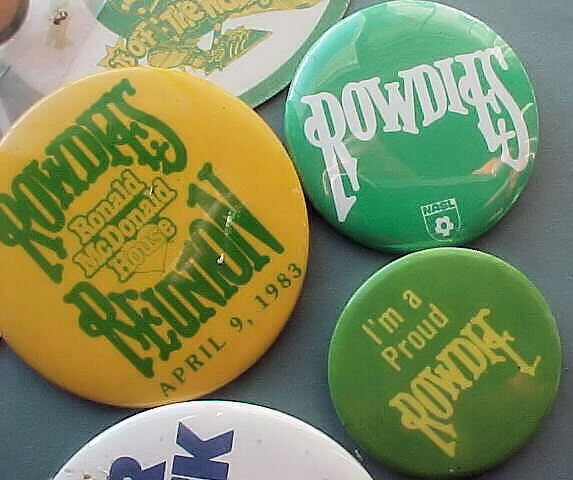 One is a 3" wide yellow & green cello pin with the slogan: "Ronald McDonald House Rowdies Reunion April 9, 1983". One is a 2" wide yellow & green cello pin with the slogan: "I'm a Proud Rowdie". One is a 2 1/4" wide white & green cello pin with the name: "Rowdies" and the NASL soccer league logo. Finally, one is a 1" wide Green, Yellow & Metallic gold clutch back style pin with the "Rowdies" logo. Ricky Hill in action against the Colorado Foxes, during the 1992 APSL Championship game. Sadly the Rowdies lost 0 - 1. A recent photo of Jean Harbor. 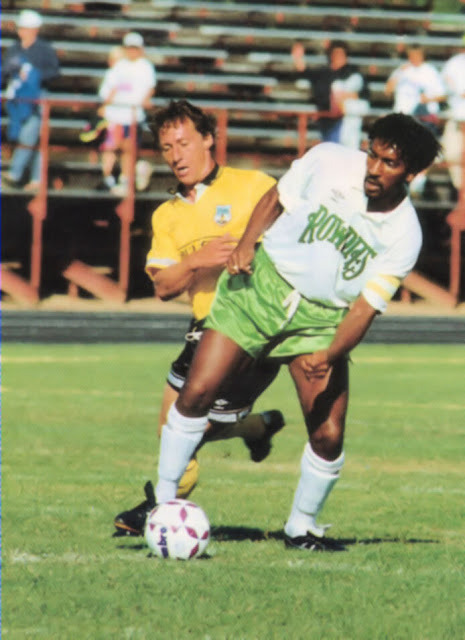 Jean played for the Rowdies between 1992 and 1993. 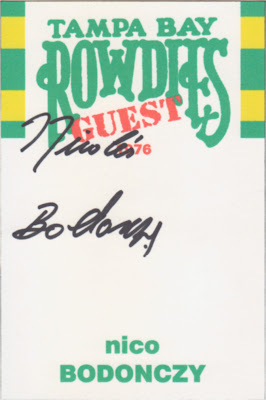 My Rowdies' Autograph "Wants List" - Can You Help? Here is my updated Rowdies' Autograph 'Wants List' - If possible on 6" x 4" white cards. If you can help, please email me. Thanks. 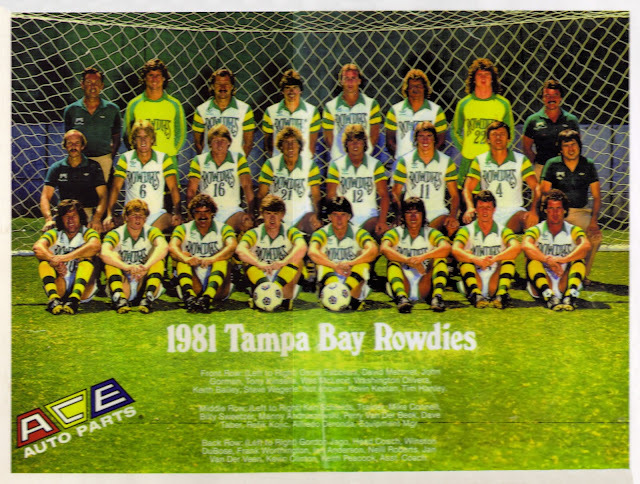 A 1981 Rowdies team photo poster, sponsored by ACE Auto Parts. Back Row: Gordon Jago (Coach); Winston DuBose; Frank Worthington; Ian Anderson; Neill Roberts; Jan Van Der Veen; Kevin Clinton; Keith Peacock (Asst. Coach). Middle Row: Ken Schields (Trainer); Mike Connell; Billy Sweetzer; Manny Andruszewski; Perry Van Der Beck; Dave Taber; Refik Kozic; Alfredo Beronda (Equipment Manager). Front Row: Oscar Fabbiani; Dave Mehmet; John Gorman; Tony Kinsella; Wes McLeod; Washington Olivera; Keith Bailey; Steve Wegerle. Many thanks to Darren Weeks. 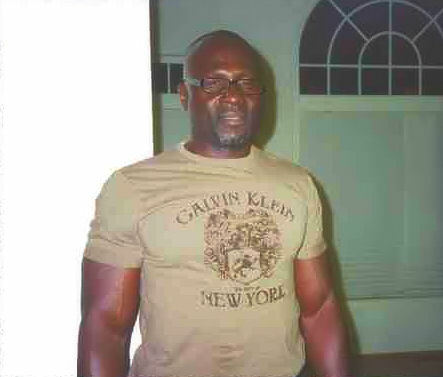 Jay White pictured in 2009. 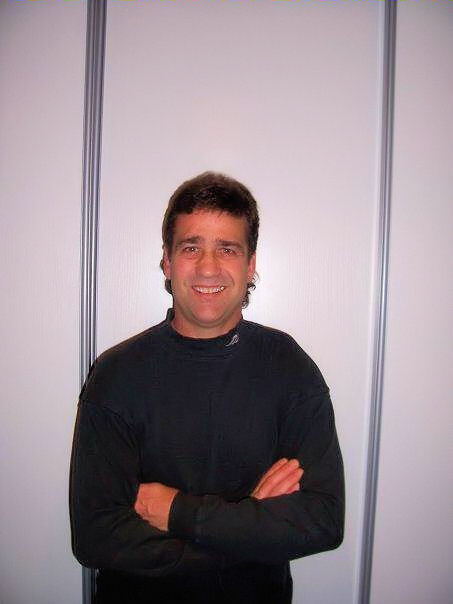 Jay played for the Rowdies between 1986 to 1990. Today Jay lives in Denmark. Many thanks to Jay for this photo. Arsene Auguste's 1974 Panini WM 74 card, whilst he was with the Haiti World Cup team. After one of the most amazing impacts in football by one man, Rodney was now a superstar! Men like - Les Allen, Mark Lazarus, the Morgan twins, Tony Hazell and of course Mike Keen are legends to QPR purists. Rodney feels that Les Allen (Father of Clive) especially deserves more credit. "Les Allen was a terrific player, I couldn't of done half the things I did without him. Les made everything work, he is one of the best players I have ever played with." Les, was indeed a great player, but all the attention was suddenly on Rodney. 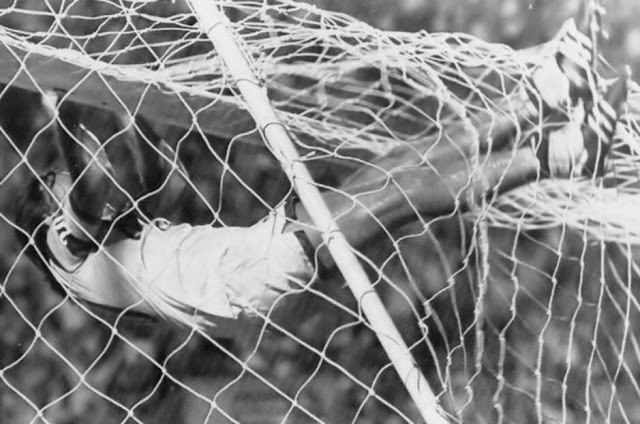 He was one of football's original crowd pleaser, always trying to do things in a harder and different way than just whacking the ball in the net. Other Managers were now starting to take notice. It's my opinion, that QPR's chairman Jim Gregory and manager Alec Stock received big offers for Rodney from other Clubs, but that Jim and Alec turned them down without letting Rodney know! Rodney had become another son to Jim Gregory, he was the favourite child, probably because Gregory was a Maverick himself in his own way. 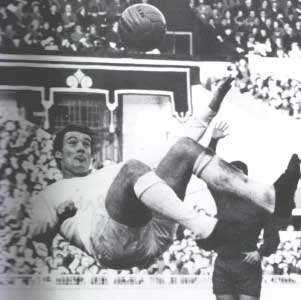 Rodney had amazingly scored 44 goals in 53 games in the 1966/67 series .... Still a Club record today! International, with a special hat- trick over Bournemouth, just a few days after the cup win. Rodney puts it down as his finest performance for QPR. In fact, he rarely scored 1 goal, it was usually 2, 3 or more. But this era produced a huge gap between Player and manager that we will never see again. The much older coaches, managers and Chairman all came from a time of discipline, many were in the armed forces and hard work, respect and Brylcreem were the order of the day. The players on the other hand, were growing up in the anti- authority swinging sixties, things like free love, getting high, men with long hair, the Devils music, Mods and Rockers fighting on the South Coast, and art college and being proud of your individualism instead of law school and uniforms completely alienated the two generations..... Suddenly, the world was in colour, Glen Miller was out, Mick Jagger was in! This Culture clash, hit the England team set up hard! Yes Sir/ No Sir was not done anymore. Players who were kids during the War had seen enough depression, and now it was party time! football world as Elvis once had in the music world- his name was George Best! George Best, Rodney Marsh, Tony Currie, Peter Osgood, Frank Worthington- and later on, Stan Bowles and Charlie George - were causing a sensation! The result being, All of Englands most skillful players were ignored by England, for as long as was humanely possible! The work horses, running up & down the pitch all day and considering 0-0 a good result and were nice polite and groomed were always going to play for England. And I don't think things have changed much. Negative tactics have been Englands way for decades. Not surprising though, that a newspaper movement, calling for Rodney to be picked for the 1970 World Cup had began. I certainly think he would have made more than an impact than the likes of Jeff Astle who QPR - a 3rd division team, had shut out of the League Cup Final! Rodney's respect is very hard to earn, and he took no notice of the QPR managers. The success of that '67 team, has been criminally ignored at QPR, as has Rodney himself. Preferring a 1975/76 team that won absolutely nothing!! But even the players today, have to realize that without Rodney Marsh, there probably would not even be a QPR anymore! He was our first and (I say ONLY) genius, in the truest sense of the word. It's easier to do something after the gate has already been opened, it's not you who took the stick for being different, a path has been laid for you. It's easy to walk through an open gate, after you have already seen what the fans want. I always ask people " Name a QPR player before Rodney." and unless you are a QPR nut, you are not going to know! Since then, people have come to QPR to watch entertaining football, because that's what they are now used to. But it wasn't always like that. Maybe like so many a genius, they will only catch on when he's not here and pretend they always thought he was the best! Lets hope not! 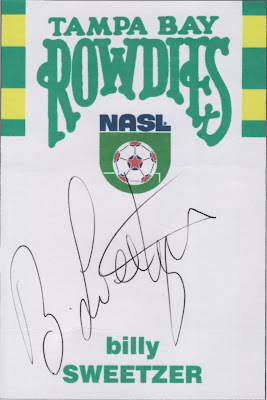 By the way, I would love to hear from everyone who saw Rodney play for the Rowdies. Please e-mail your memories to the e-mail on this site and write to Tel Currie. I would be extremely grateful. 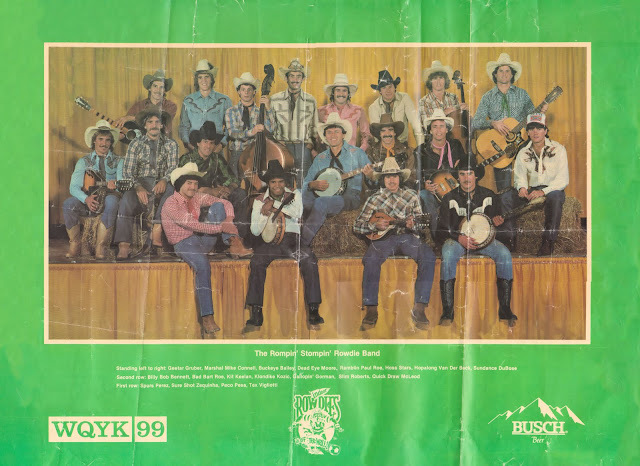 A 1982 Rowdies poster showing the 1982 indoor team, the poster shows them dressed as "The Rompin' Stompin' Rowdie Band". The poster measures 24" x 18" and was a give away during the 1982 indoor season. Sponsored by WQYK 99 and BUSCH Beer. The players shown are: Back Row: Peter Gruber; Mike Connell; Keith Bailey; Terry Moore; Paul Roe, Jurgen Stars; Perry Van Der Beck; Winston DuBose. Middle Row: Carl Bennett; Peter Roe; Kevin Keelan; Refik Kozic; John Gorman; Neill Roberts; Wes McLeod. Front Row: Hugo Perez; Zequinha; Nejgo Pesa and Ray Vigliotti. Many thanks to Ray Vigliotti for this poster. 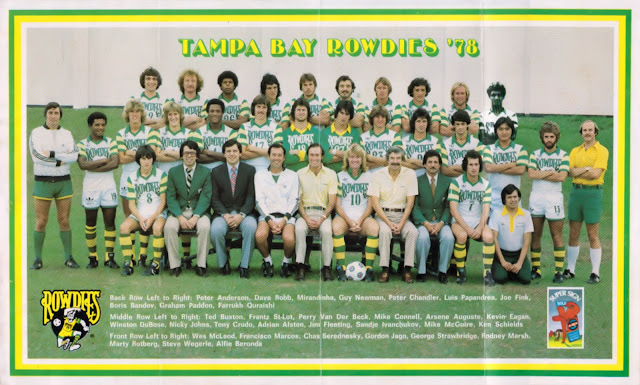 A 1978 Rowdies team poster that was given away at the ground, sponsored by Super Sign. Oscar Fabbiani celebrates scoring in 1979. 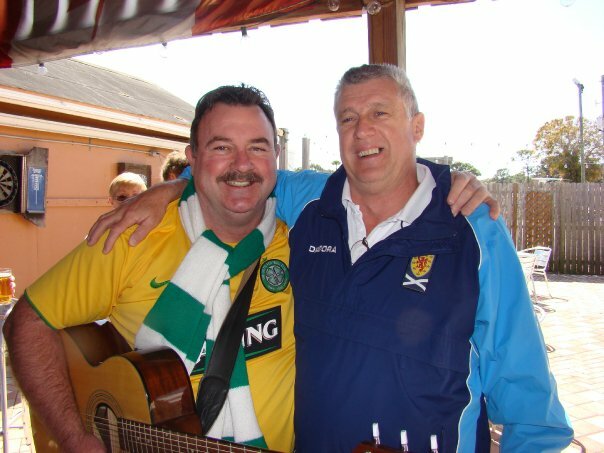 A recent photo of original Rowdie Doug Wark with his fellow Scotsman Kevin Kiernan. Many thanks to Doug for this photo. 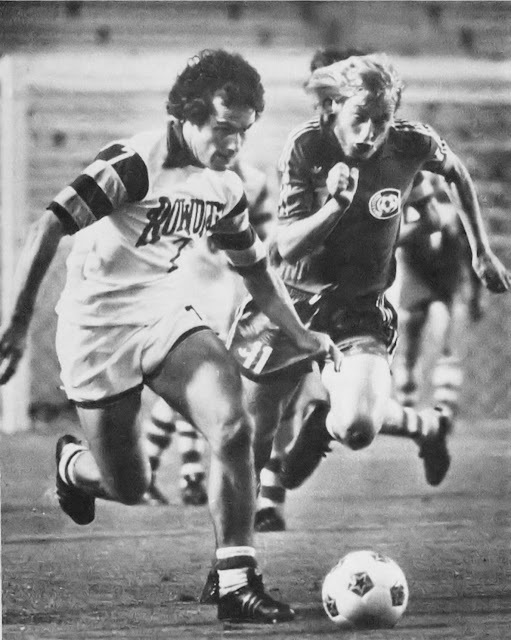 Steve Wegerle is chased by Connecticut Bicentennials' Greg Downs in 1977. Wim Suurbier's 1974 Panini WM 74 card, whilst he was with the Holland World Cup Team. Today, I received a signed card from Billy Sweetzer. A BIG thank you to his nephew Darren Weeks in helping me obtain this. An advertisement for Carla's Dance Studio showing the Wowdies. 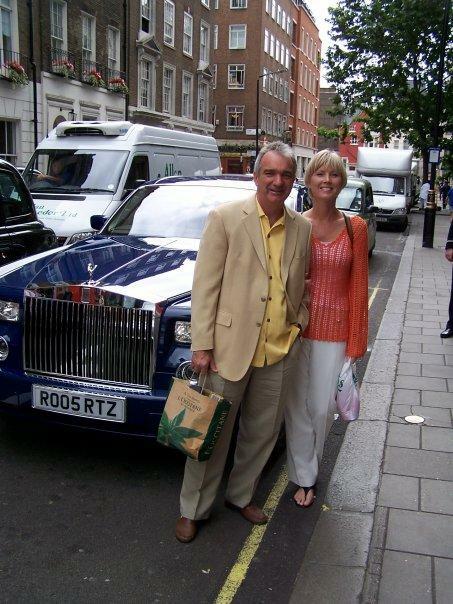 Peter Anderson on a recent trip to London. Many thanks to Peter for this photo.